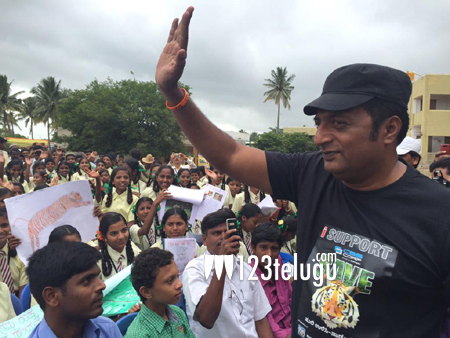 Prakash Raj, who is well known for portraying multifaceted characters in movies, is now sparing some of his time in bringing awareness among the school children and villagers of Bandipur (Karnataka), regarding the ways to protect our national animal. ‘Save Tiger’, a national level initiative which has been championing the need for conservation of tigers, has roped in Prakash Raj to create awareness and inspire the young minds of the nondescript places in Karnataka. As a part of the campaign, he is currently busy travelling to the Nagarhole forest area of the Karnataka state and interacting with the people residing there. After completing this campaign, he will join the next schedule of Kamal Hasan’s Cheekati Rajyam.